Treck Hostel i Ghent, Belgien : Boka nu! 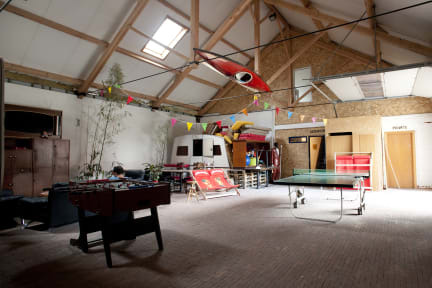 Our building is a former brick factory which is part of the cultural heritage of Flanders, the building is completely heated in winter so you’ll be able to camp all year round. There’s a bar on site where you can have a beer while meeting locals or watching a free concert, playing a game. We have a communal room where you can play table tennis, ping pong, read a book, have a chat, relax. We have a big outside space where you can sit in the sun, repair your bike in our ‘bike kitchen’ or play jeu de boules. You can prepare a lovely meal in our kitchen and organise a meeting in our meeting-room. Treck Hostel is situated at 1 mile from the historic center of Ghent and it’s within easy reach by public transportation. Therefore we advise not to come by car. When you make a reservation, you can hire a bike to explore the city. Treck Hostel is also a perfect base to explore the other cultural cities of Belgium: Bruges, Antwerp and Brussels are within easy reach by train. -Zen: Feel completely zen in this caravan, we removed the kitchen to create some space for an altar for a mini Budha. You're being welcomed at the door by Ganesh, protector of the traveler. -Graffiti: This caravan is an artwork. Each side has another design, don't forget to look at the top! -Hawaii: In our Hawaii caravan, you feel like you're in some warm country. The hammock is waiting for you to jump in and relax after a long day of exploring the city. -Retro: We had a lot of work on this one - to paper a caravan is not easy - Finally we succeeded in giving a retro touch to this caravan, enjoy it! -Up: This former coffee bar/ caravan was placed upside down. The door became a window and the roof got an entrance! This caravan is perfect for 3 friends who like to have a bed of their own. -Jungle: This caravan is hidden between plants and greenery, you can find tigers and monkeys between the trees. Here you'll find an experience closest to the outdoor-camp-life, but you can forget about the cold, rain and strange noises.Camp int he city with all the luxury of a hotel. -Beach: Flippers, swimming goggles, racket and 2 comfy beach chairs are part of your terrace. Can you feel summer yet? -Betty: Betty Boop is on the lookout! Be aware of the peeping tom in the back! 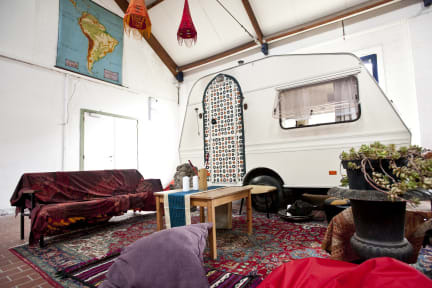 When you see the interior of this caravan, you'll see why the designers choose this theme. - Mini: Our smallest & cutest caravan. We don't really know if it's a two person or a one person bed...We do know that there's a lot of authenticity in this one; the curtains, the lights, the bench,.. they are all like they were years before. This one is perfect for couples who like to cuddle all night long or travelers who like to have the bed/ caravan for their own. - Bird’s nest: This wooden cabin is made by an artist, it's a cosy place overlooking the hostel. Payment upon arrival by cash, debit cards. (This property may pre-authorise your card before arrival). Trevligt och var värt pengarna. Stannade även en natt extra.